Another rough outing for Clay Buchholz, another lackluster performance by the offense, another loss for the Red Sox. The Tampa Bay Rays scored twice in each of the first two innings in a 5-1 win over the Red Sox at Fenway Park. It was Boston's 4th loss in a row. Buchholz was charged with a 5 runs in 6.1 innings. He allowed 9 hits and struck out 7 while walking 2. His record dropped to 1-4. 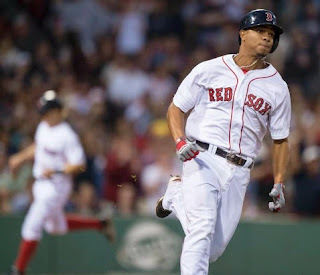 Boston's lone run came on an RBI triple by Xander Bogaerts (pictured) in the bottom of the 2nd. Brock Holt had two hits for the Red Sox. Left fielder Hanley Ramirez left the game in the first inning after running into the left field wall trying to make a catch. The initial diagnosis was a shoulder sprain. Ramirez was replaced by Allen Craig.